The Department of Landscape Architecture at University of Illinois is an incredible program within the College of Fine and Applied Arts. The students here are trained to see blank spaces as opportunities to create beauty and function in our world. Guided by both professors and practicing professionals, students have emerged from the program equipped with the knowledge and skills needed to succeed in their industry for the past 110 years. Bureau Gravity’s work with The Department of Landscape Architecture began with an in-depth discovery session focused around four key areas: their background, objectives, positioning, and messaging. It was concluded that the school was having a hard time broadcasting the values of this program and being able to articulate all that it had to offer both future and present students, along with communicating those benefits to parents. Our world today has a strong focus on community, sustainability, conservation, and social equality. Landscape Architecture has a hand in all of those topics, and it was time to shout it from the rooftops. Bureau Gravity created a platform that allowed The Department of Landscape Architecture to be seen and heard by students looking to change the world. And who better to tell the story than those living out their dream? 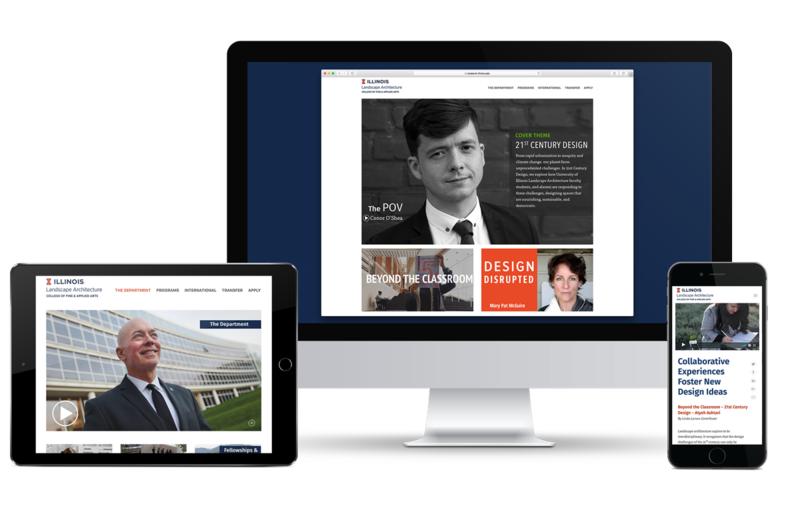 Utilizing Bureau Gravity’s customized digital platform, the department underwent a complete redesign of their website. Bureau Gravity introduced interviews with professors as well as past and present students to get the word out on what makes this area of study so great. Not only was the information presented on the website completely overhauled, it will continue to be refreshed on a quarterly basis. Bureau Gravity will maintain the uniqueness of the website with quarterly site visits to capture topical stories, and fresh perspectives and interviews. There will be new cover themes and content constantly being rotated in to ensure viewers keep coming back for more. This improvement in their digital presence has led to an overall increase in awareness for the program. The dropping rate of landscape architect majors was due to lack of understanding the value behind the degree. Bureau Gravity stepped in and helped them articulate the benefits frequently and authentically through unique journalistic storytelling.